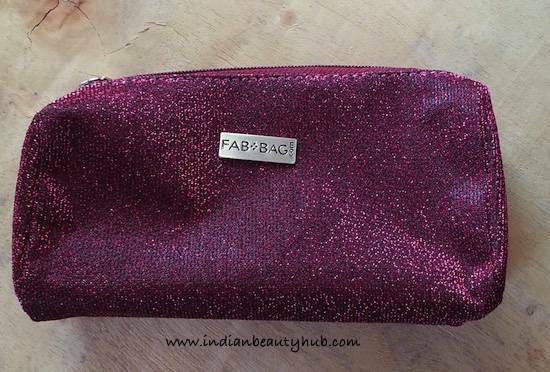 Hey everyone, today I’m sharing the review of the Fab Bag September 2015 which is their 3rd Anniversary special bag. 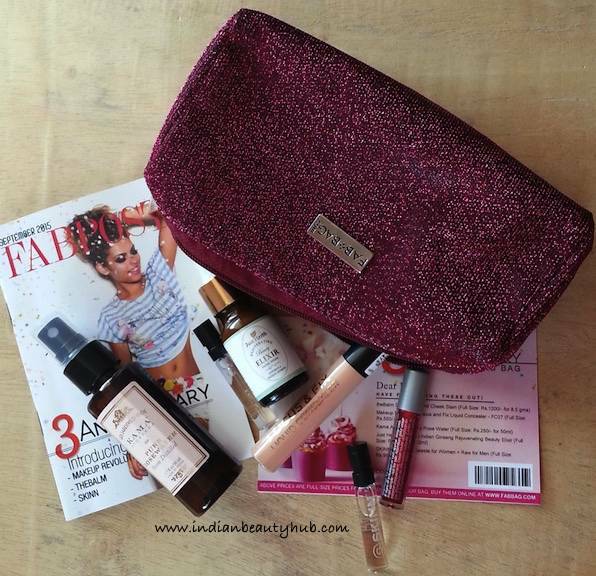 This month all the products samples came inside a beautiful shimmery maroon pouch that I really liked. 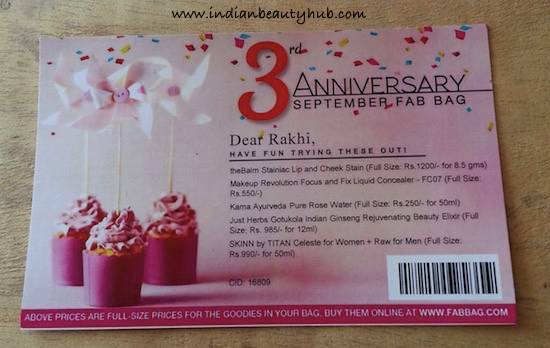 I received a total of 5 products from some popular brands like Kama Ayurveda, Just Herbs, Makeup Revolution, theBalm and SKINN by TITAN. 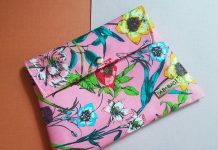 Along with all the products, the Fab Bag also had a monthly Fab Post magazine that includes all important information related to the products and other offers at the Fab Bag. 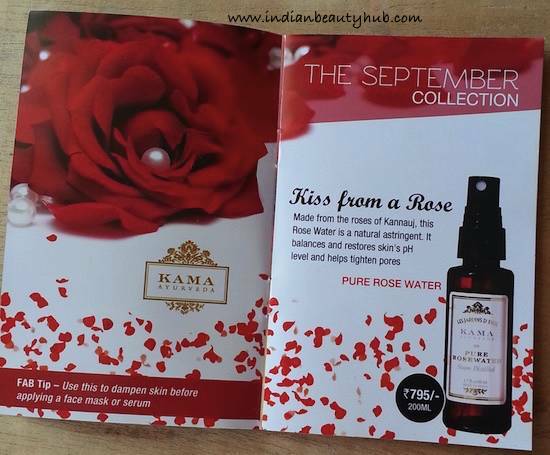 Kama Ayurveda Pure Rose Water: The bag contains full-size bottle (50ml) of this amazingly fragrant rose water. It can be used as a toner or facial mist. I used this rose water in the past and really liked it. 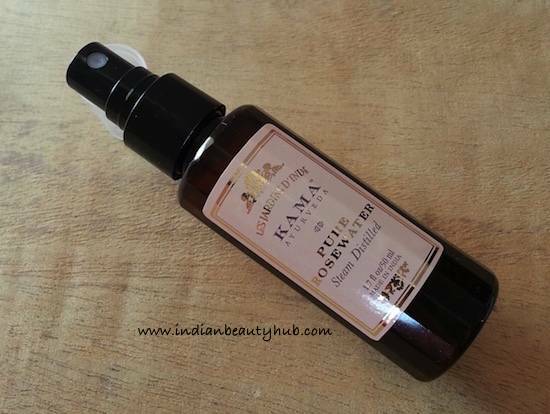 The price of the Kama Ayurveda Pure Rose Water is Rs.250 for 50ml. 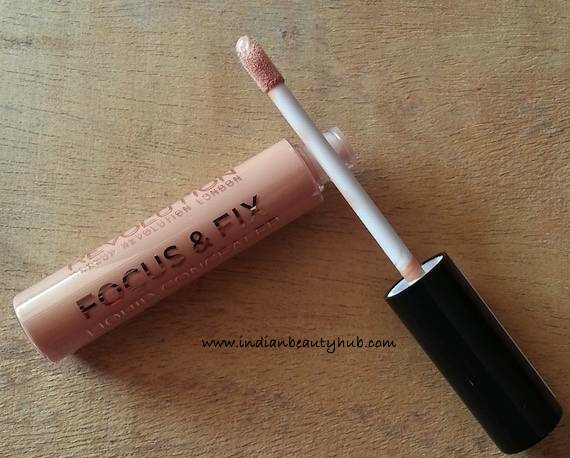 Makeup Revolution Focus and Fix Liquid Concealer: I received the shade FC07 which is a little dark for my skin tone. This high coverage liquid concealer has a creamy formula and it provides a long-lasting natural finish. 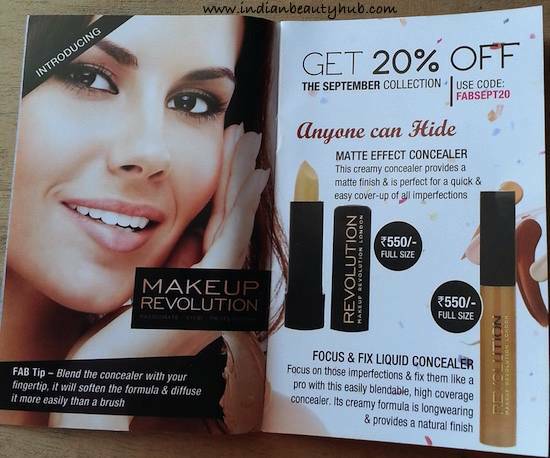 The price of the Makeup Revolution Focus and Fix Liquid Concealer is Rs.550. 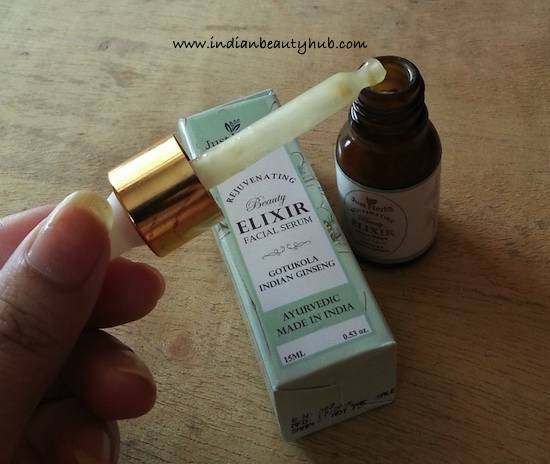 Just Herbs Gotukola Indian Ginseng Rejuvenating Beauty Elixir: My most favorite product from this month’s Fab Bag is the night serum. It claims to nourish the tired, aging and pigmented skin. I got a full-size bottle of the serum that will easily last for a month. I’m very excited to try this serum and will share my views after using it. 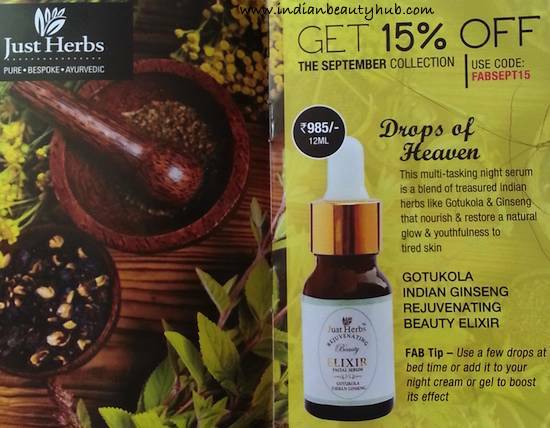 The price of the Just Herbs Gotukola Indian Ginseng Rejuvenating Beauty Elixir is Rs.985 for 15ml. 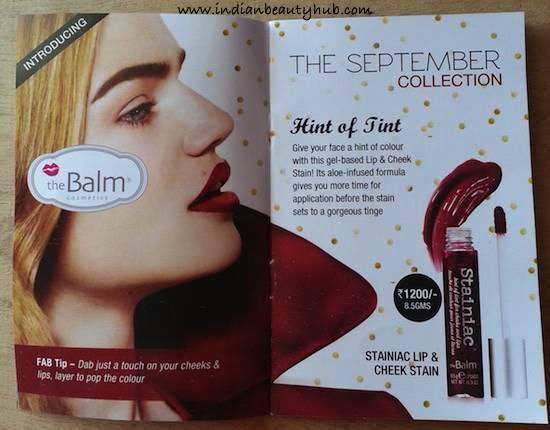 theBalm Stainiac Lip and Cheek Stain: I received 1.2ml sample of this 2-in-1 product. It is a pretty pink color with purple undertones. This sample size will easily last for 5-7 usages. 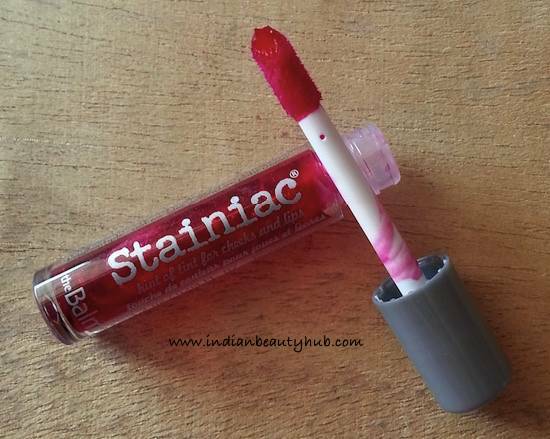 The price of the theBalm Stainiac Lip and Cheek Stain is Rs.1200 for 8.5g. SKINN by TITAN EDP: Last but not the least the September Fab Bag contains two perfume samples, Celeste for Women and Raw for Men. 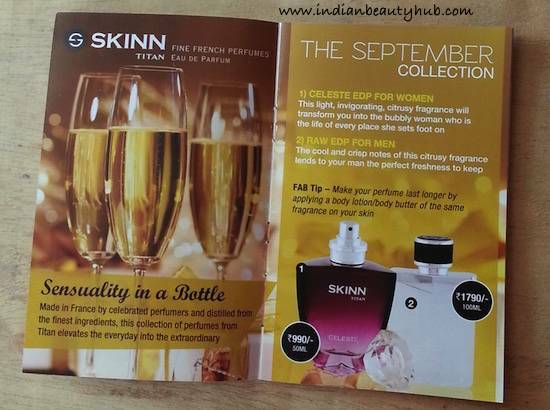 The price of the SKINN by TITAN EDP is Rs.990 for 50ml. 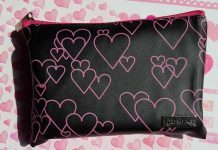 Overall I'm highly satisfied with the September Fab Bag and liked everything that came inside the bag. 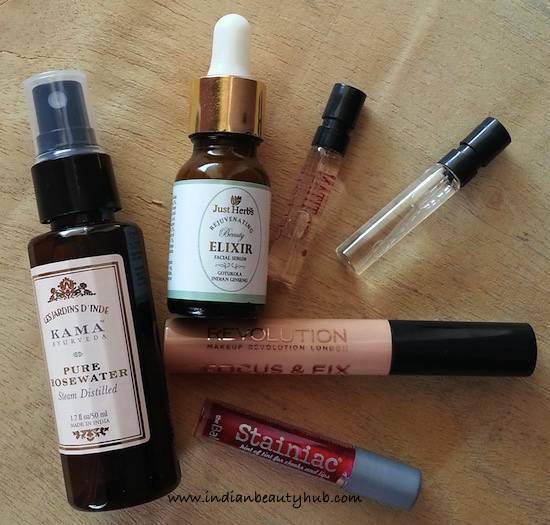 Just Herbs night serum and Kama Rose water are my favorite products of this month. 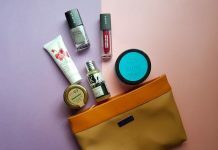 I subscribed almost all the beauty subscription boxes available in India and found out that the Fab Bag is the only box which has kept on improving its product's variety, brand, and the quantity., and all that at an affordable price. 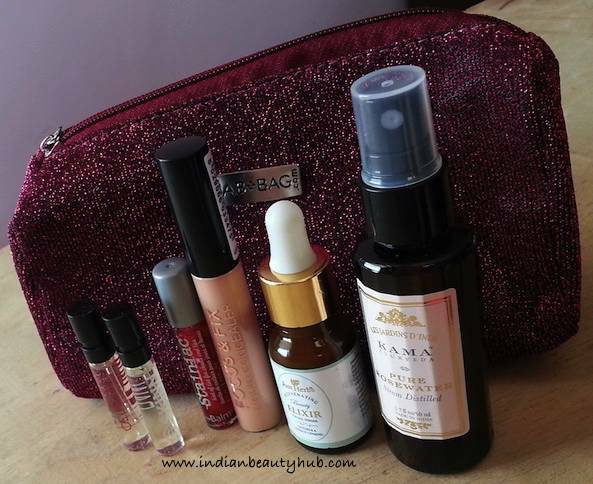 I wanted liquid conceler…bt got dry one….not happy with my first fabbag.